Inspiration! Today, listening to David Crystal OBE, triggered so many fantastic ideas to share the languages spoken in our own communities and speak up for languages and their value in our communities.. Links between languages, celebrating languages, links between languages and literacy, sharing our languages…. the list goes on. 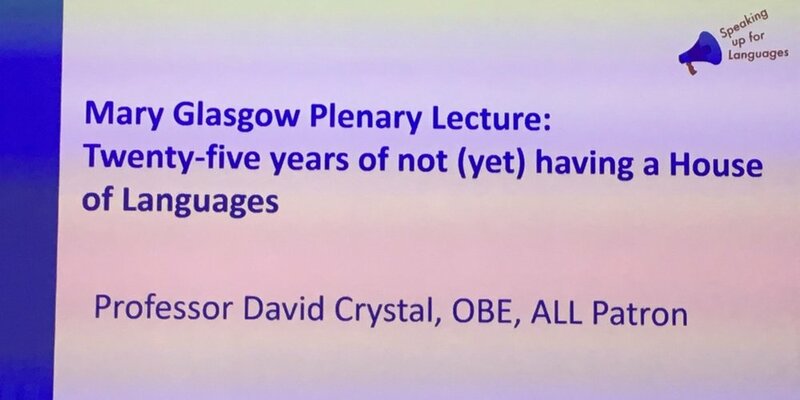 I had the great fortune today at ALL Language World 2019 to attend the Mary Glasgow Plenary Presentation, “Twenty five years of not (yet) having a House of Languages”. Intriguing title ! His vision is for a museum of “living “ languages to “speak up for languages” and to share the importance and relevance of languages in everyone’s lives. During the presentation I was inspired to tweet possible ways that we in all our primary schools, clusters and MATs icould contribute to a nationwide interconnected “House of Languages”. Here are the tweets in order of inspiration.Hope that may inspire some of you who read this to perhaps investigate further the suggestions and create “Planet Words” in yoour own communities and schools. Alphabet sculptures……Great languages, literacy, home languages and Art links here. Wonderful way of playing with sound and voices and how you may sound in 10 years. Possible great drama / science and primary languages activity #CLIL2019 inspired by David Crystal’s description of scientific boice analysis booths @ALL4language conference. Got my thinking hat on! Celebrating all languages in our schools. Bringing home languages and primary foreign languages together.Celebrate and collate all the languages we use and hear in our learning communities. Exploring the “mundo lingua” space in Paris via this website link.Use this as a platform to design your own “mundo lingua” spaces in schools. Enage with the wider local community.Create library spaces in shared areas to share books from all the languages spoken and written in our communities. Take this further and create multi-lending spaces in empty spaces and shops in our local hgh streets. Set your children a challenge.Design language museum spaces of the future.Be inspired by the internatioanl architecture competition to design suitable spaces with interactive devices to share the excitement and diversity of languages. Celebrate “English” and its origins.Find out more about the Winchester project.Become experts in your own schools and look at the origins of the English language. Great literacy, languages, history and geography investigations here. Explore “Planet Word” and find out about this interactive language museum in America is taking shape. Take inspiration from this and build a speaking wall or a languages walk of your own in school , to celebrate “Planet Word” in your own school.